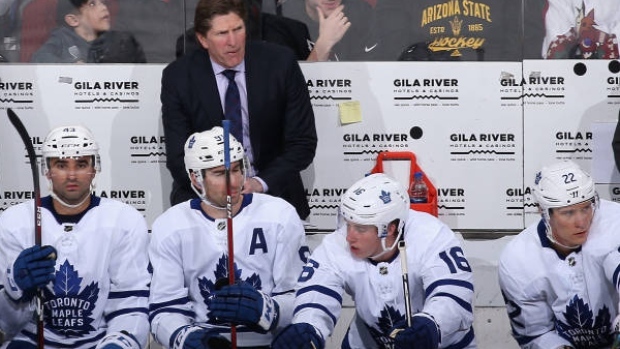 TORONTO – Picking up the pieces from their worst week of the season, the Maple Leafs are trying to take away something other than disappointment from an awful four-game stretch. Improving on what just transpired shouldn’t be hard. Toronto bookended last week with four-goal losses to the NHL’s best team (Tampa) and its worst (Ottawa), while going a collective 1-3-0 and allowing 23 goals against. It’s a late-season fall so staggering that backup goalie Garret Sparks felt compelled to call out his team’s lack of emotion following a 6-2 loss to the Senators on Saturday. By Monday, the theme was turning the page. It had been weeks since Toronto last had a day off and practice day at home between games, a coveted opportunity to recuperate mentally and physically in this condensed span of the schedule. The Leafs used Monday’s session to dial in on their defensive play. The team will be right back to work on Tuesday in Nashville for the first half of another back-to-back set, before heading to Buffalo on Wednesday. TSN Director of Scouting Craig Button joins Jay and Dan in the Coors Side Seats to weigh in on the Maple Leafs' current woes, the Canadiens' offensive struggles, the Flames Stanley Cup potential and more. Toronto entered last week averaging 2.83 goals against per game, and allowing the eighth-fewest goals all season. The Leafs gave up at least five goals in their next four games, with 21 of the 23 coming at even strength. They also fell behind by at least three to every opponent. While long-term injuries to Jake Gardiner (back) and Travis Dermott (shoulder) have no doubt caught up to the Leafs and weakened their play in the defensive zone, a poor spell of goaltending from Frederik Andersen (1-2-0, .765 save percentage) and Sparks (0-1-0, .864 save percentage) has made matters worse. For a club that's been hyping its own depth since training camp, the last seven days have exposed cracks in the Leafs' organizational foundation. It’s a strong message for Babcock to relay, although if either of Calle Rosen (foot) or Andreas Borgman (concussion) were available to be recalled from the American Hockey League’s Toronto Marlies, the Leafs’ blueline might be better off. Babcock also made it clear Monday that 19-year-old prospect Rasmus Sandin won’t be rushed out of his first AHL season to try to rescue the Leafs, despite tallying 11 points in his last seven games. ​That leaves the same Leafs who got themselves into this mess responsible for finding the way out. The Leafs should have top-six winger Kasperi Kapanen back in the fold in Nashville after he missed the team’s last four games with a concussion. But just as Toronto gets one piece back, another domino falls in Frederik Gauthier, who won’t be on the trip due to a foot ailment. Regardless, winning isn’t optional for the Leafs now if they still intend to close the four-point gap on Boston for second in the Atlantic Division and have the inside track on home-ice advantage for the first round of the postseason. In order to do that, Toronto will have to start acting like a playoff team again.